The picture is depicted in perspective from top to bottom, as if the view of the street from the window. By the gentle brown tones, it can be judged that winter has recently come into its own. The sky is grayish, overcast and low. On the street you can watch the snow, so fluffy, light and clean. By the presence of a small number of tracks near the house, we can assume that the snow most likely was at night. In terms of the amount of snow, there was supposedly rather heavy snowfall. The whole street has quite changed in the morning under the cover of snow. There are still air and big snowflakes circling in front of the windows, which are circling winds in the air. The houses were transformed from the new decoration on the roofs, became more fun and more elegant under the white decoration. The roofs of the houses are completely covered with snow. Similarly, under the snow cover there are window frames and window sills, the wide sidewalk is completely hidden under the fluffy snow. On the tree between the houses, dried leaves did not have time to fall off, which indicates recent warm days, but the snow, as directed by winter, completely covered the branches on the trees with its remnants of leaves. From the presence of snow on the street is very light, even hurts the eyes. It is grayish, pinkish in places, and near houses even with a yellowish sheen. There are winding tracks on the snow cover. Some of them belong to a small puppy, which may have stopped, but still admires the first snow, seeing it for the first time. Other tracks, leading from different sides, belong to the three girls, who are madly happy about the first snow. Apparently, they are friends, because they live in the neighborhood. Waking up in the morning and looking out of the window, they ran out into the street, having only put on hats. 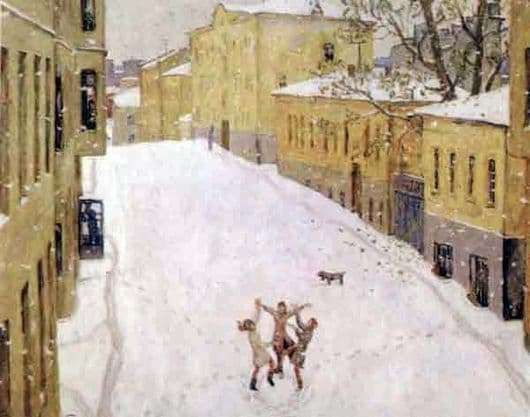 They are holding hands, jumping and spinning, rejoicing in the first snow. In the phone booth you can see the silhouette of a man talking on the phone. Outside the window one can see the outlines of a man who is lost in his thoughts, who has been closely watching the snow and what is happening. The first snow in everyone causes a feeling of celebration in the soul. Everything is white, elegant and festive.